Part & Parcel is a concurrent exhibition that will take place in Studio/Gallery #394 at the Northrup King Building in Minneapolis’s thriving Northeast Arts District. 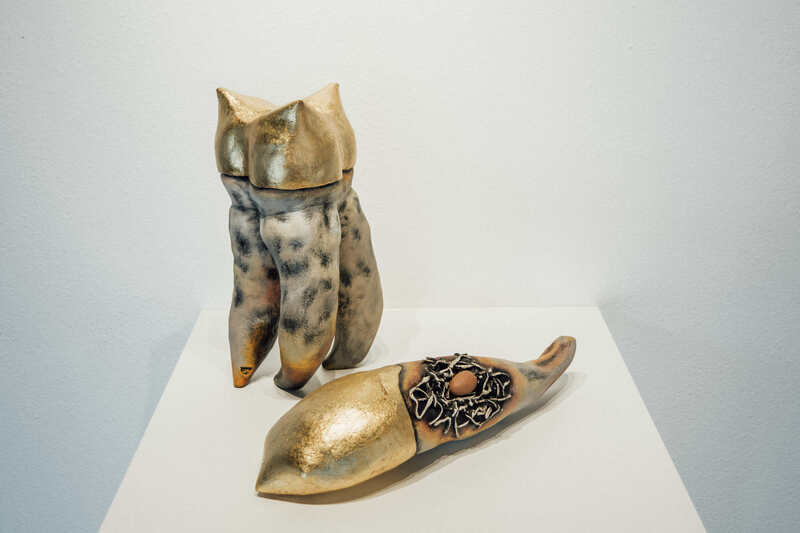 Featuring a diverse group of four midwestern ceramic artists, Part & Parcel brings together work ranging from vessels, to fragments, to modules, and to figurative sculpture. Participating artists are Gratia Brown, Wendy Thoreson, Lauren Tucci and Claudia Poser. “So fascinated have I become with the gesture of broken and discarded clay that I purposely create pieces that I hope will provide breathtaking fragments. I allow myself to work intuitively – forming animals, frequently doodled shapes, as well as abstract and impressionistic studies in clay, color, and line. Pieces are slammed, crushed, and embraced – fulfilling their purpose as fragment farms. This process reveals the unintentional beauty of the internal architecture of ceramic construction. 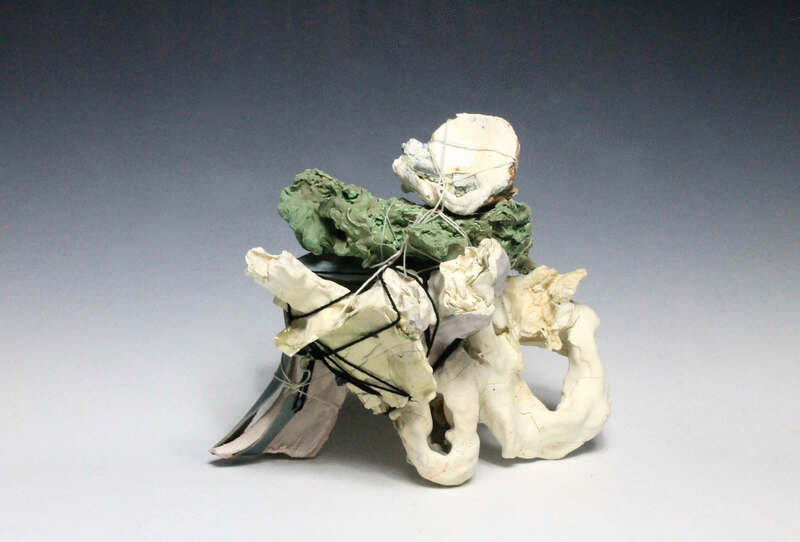 Necessarily incomplete, the abruptness of jagged edges and the rhythmic caverns of broken ceramics beg to be examined, cropped, and framed with additional fragments, surface treatments, and material. She is currently an Assistant Professor of Art at Northern State University, Aberdeen, SD, where she teaches Ceramics and Design Foundations. Wendy Thoreson describes her work as “Functional Heirlooms”. A major inspiration in her work is wrought iron. She is endlessly fascinated by how scrolls roll in and out of each other, fitting comfortably between their structural counterpart. She once took a blacksmithing class and now uses some of the basic concepts she learned shaping hot metal to shape soft clay. 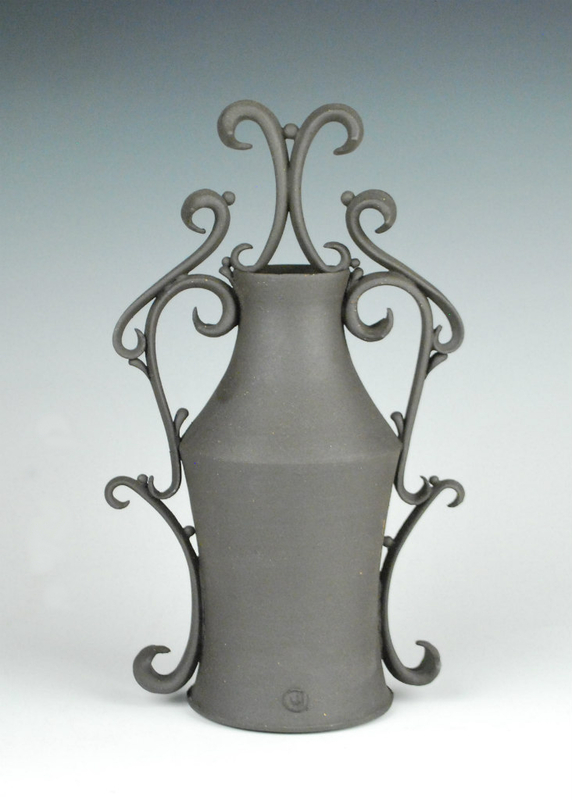 Each piece starts with a basic form, then she builds scrolls that fit and grow in relation to the pot. Some scrolls are based on traditional wrought iron designs, others are more organic. Function is welcome, but not paramount. Her work is a constant exploration in balance, flow, and elegance. Much like the scroll work, the holes are another element of balance and pushing the boundaries of function. They are small and lacy, giving the body of the pot lightness and contradicting the notion that functional pots cannot have unfunctional elements. The perforations are another way to incorporate negative space in an unexpected way. For her every piece is new problem to be solved, each one evolving from previous solutions. Wendy is currently studying in a post-baccalaureate program at Concordia University in St, Paul MN. Lauren Tucci is inspired by artists of the Surrealist and Symbolist movements. Her art stems from perceived realities in relation to how we derive meaning through everyday interpreted symbolism and subconscious thoughts rooted as deeply as one’s dream state. Her current body of work objectifies personal emotions and conditions in the form of recognizable imagery, sometimes disjunctive or mise en scène. Framed instances in installations become linked chaos, much like dreams in a non-linear narrative. She sculpts human and non-human segments in delicate and callous themes to converse with our psyche, a reflection to conflict and relationships. Social status and contemporary themes of power and insecurities are illustrated without a demographic definition. She seeks to remove conventional understandings of the self and explore a discussion about personality purely through the imagery we define as a community. Lauren is currently a gallery manager and studio artist in Cedar Rapids, Iowa. “We are living in a constant state of overstimulation. We are bombarded with flashing lights, lightning shifts in imagery and explosive bursts of color. This constant level of visual excitement leads to tension and stress. My artistic vision is to create objects and installations of quiet and harmony. I aim to provide islands of restoration for the human eye and spirit. Lately, she has been drawn to incorporating images of endangered animals on her modular sculptural pieces in response to the acceleration of ecosystem destruction. Claudia is currently a studio artist in Minneapolis. The Part&Parcel opening will be held on Friday, March 29th from 5 – 9pm. The gallery will be open as follows: Tue 12-5pm, Wed 10am-7pm, Thu- Fri 2-9pm, and Saturday 12-4pm.